Have the opponents of CS9 won a quiet victory? Labour election leaflets contained the same statement. The only confusing thing is the phrase “we are lobbying“. This implies that the Mayor of London has the final say over where the cycle superhighway runs and therefore requires lobbying. But he does not. Hammersmith & Fulham transport officers have made clear that the final say over the use of these streets rests with Hammersmith & Fulham Council. Labour councillors have also made this clear to residents. One anti-CS9 group copied me to this from a Labour Councillor “The council’s stated preference is for a cycle superhighway to run along the A4 not Hammersmith Rd. As the ultimate decision lies with LBHF, we can probably assume that CS9 will not go ahead in the form in which it was presented”. Fairly straight-forward, repeating the manifesto commitment, but again clarifying where the decision lies. Of course the use of the phrase “we are lobbying” is designed to “please all of the people”. Group A should love us because we tried to stop it and Group B should also love us because we let it go ahead. So residents should now be looking for some answers and for some commitments. Residents are entitled to know how the Council Administration reached its decision. They also need to know what “lobbying the Mayor” actually means in this context. Since late last year the Council has been receiving submissions from residents on CS9. At a Council Committee meeting earlier this year which discussed CS9, it would have been entirely possible for a summary of the consultation’s results to be presented. But no information was provided. Hammersmith & Fulham residents remain in the dark about the results of the local consultation, and how the responses break down by how close people live to the proposed route or by their preferred transport methods. They are also in the dark as to why H&F Council has decided to “lobby the Mayor” to change the CS9 route. Those in favour of CS9 will be particularly keen to understand and debate the change of heart and to understand the policy rationale behind it. As far as CS9 goes, these commitments are empty words. The Council has long been able to share the consultation results with residents. It has declined to do so. As for making policy in public, I am sure all those in favour of CS9 and all those against CS9, are more than keen to participate in this process. We need venues, dates, and information. The A4 is such dumb idea. The point of CS9 is obviously to boost cycling but those pro have always made the case that it would humanise CHR. Why not put the cars down the A4 and the bikes down CHR?! CHR is such a dumb idea – promoting cycling at the expense of pedestrians rather than at the expense of cars. 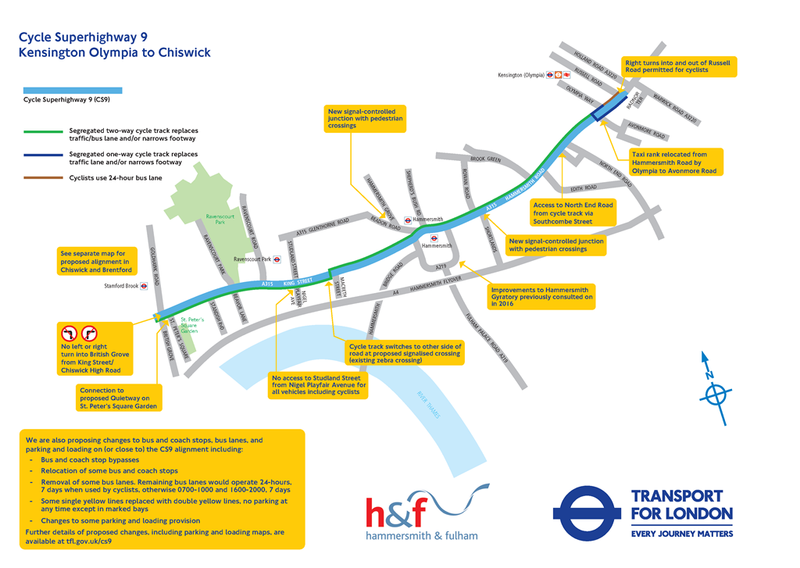 Thinking outside the box here, but why not do something really bold like put the main traffic routes into and through Chiswick and Hammersmith into a tunnel? A ‘flyunder’ if you will. Then the existing roads would be much more peaceful and less polluting, and could easily be shared by different modes of transport, without the need for all the clunking infrastructure of CS9.